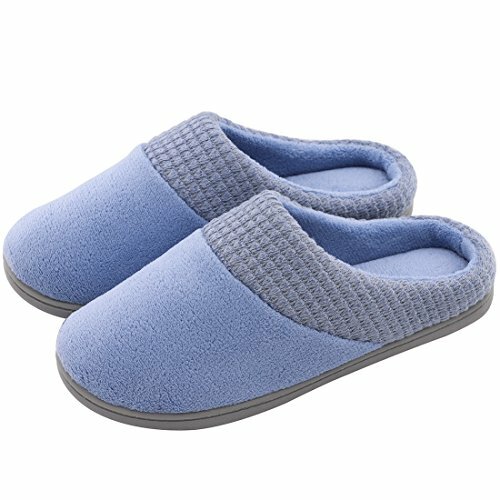 ULTRAIDEAS Classic Terry Memory Foam Slippers - Refreshing Your Daily Life! When you get home after a long day, all you want to do is kick back and relax. But once you kick off your shoes, walking around barefoot on your hard floors isn't really doing your tired feet any favors. Show your feet a little love by giving them a pair of soft and cozy slippers to slide into. You'll love the feeling of the terry plush lining, and the high-density foam base will have you feeling like you're walking around on clouds. Grab a pair today and give those hard-working tootsies a break. Why Choose Our Terry Plush Slippers? •The soft and high-quality terry plush can perfectly adapt to your feet and make these slippers suitable for all seasons. •The edge of the slippers is seam crafted, not easy to crack, solid and reliable. •Padded with multi-layered foam cushioning, the slippers will still retain its own shape for many times wearing. •Machine or hand washable, easy to care. FEATURING SOFT TERRY PLUSH UPPER & LINGING: Constructed with comfort terry plush upper and lining, these slippers could keep your feet nice and toasty whether in socks or bare feet and wick the moisture away for your all-day wearing. STYLE & COLOR OPTIONS: With classic but sophisticated design, these slippers are perfectly suitable for the persons of all ages and really great gifts for your loved ones. They are available in your choice of Gray, Pink & Blue. Hand & Machine washable.